I'm not Catholic. My husband is. Sometimes this matters not at all and sometimes it matters a lot. As our kids get older it becomes an increasingly more complex discussion because we want to give them a firm foundation of faith. We recently started church hopping again because the Catholic one we were attending just didn't seem to be the right fit. Why? I don't know. I just wasn't being filled. And our kids weren't being filled. Why? I don't know. Me: I'll become Catholic as soon as they start accepting birth control and gay marriage. John: What about women priests? Me: Oh yeah, that, too. But of course this is a just an easy, flippant answer. I disagree with the doctrines (or dogma or some word like that - John, as a theologian, gives me a hard time about my lack of proper word choice in these matters) and thus I cannot join the denomination. Easy. But it's not really true. I don't really scrutinize the doctrines of churches I attend. I've quite happily belonged to other churches that were against gay marriage and I was content to "agree to disagree". And I know quite a few practicing Catholics who disagree with major parts of the Church. Heck, I'm even friends with a Roman Catholic Womanpriest! So why, really why, am I not Catholic? I don't know. So I've been reflecting lately on what it has been that has drawn me into churches. I grew up Presbyterian. Obviously I didn't choose this church, but there were quite a few things that I liked about it, including the Sunday school classes that dove deep into the scriptures and really challenged me and the youth group trips to serve the poor in downtown Pittsburgh at soup kitchens and through rebuilding houses. In college I didn't have a church home for a while. Then a (Catholic) friend of mine took me to Park Street, a Congregational Church and I kept going there each week by myself. I really liked the exegetical preaching there. The 45 minute sermons that Dr. Hugenberger preached each Sunday were amazing. Plus I loved how easy it was to get involved there. I sang in the choir and was a high school youth leader. After college I moved to Cleveland and after a bit of church shopping, landed at a Friends church. I liked the music, but missed the bits of liturgy that were present at some of the other churches I had attended, so on the side I sometimes went to a Catholic parish that did a contemporary Life Teen service. In Kansas City, John and I went to the Catholic church where he led worship and also to an Anglican church where we could receive the Eucharist together. I still miss that Anglican church. It was the only place where John and I have really felt comfortable together. It was just enough of each of our traditions, plus great, prayerful contemporary music. We had friends there and the kids had engaging, Bible teaching Sunday school classes. It's hard to draw any patterns from my past churches. There are different doctrines, different worship formats, different preaching styles and different music styles. The only constant is that at each of these places I was able to connect with God. Maybe I'm making it all about me. Maybe I'm not Catholic because I can't appreciate the "mystery" in the mass because I'm just too self-centered and want it to be all about my experience. No, I think that's too harsh a critique. I don't think it's selfish to want to feel God and connect with Him within the Sunday service. I know some Catholics who would say, "If you only understood... then you would...". Maybe it's that I'm just not intellectual enough. Maybe it's something about my ISFJ self or my sensitive, orchid self. Or maybe?... I don't know. I asked John, my Catholic theologian husband, why he's still Catholic, expecting to get some intellectual answer. But he tells me it's simply because he still feels called to be Catholic. Good answer. I guess maybe I'm not Catholic because I still feel called to be Protestant. 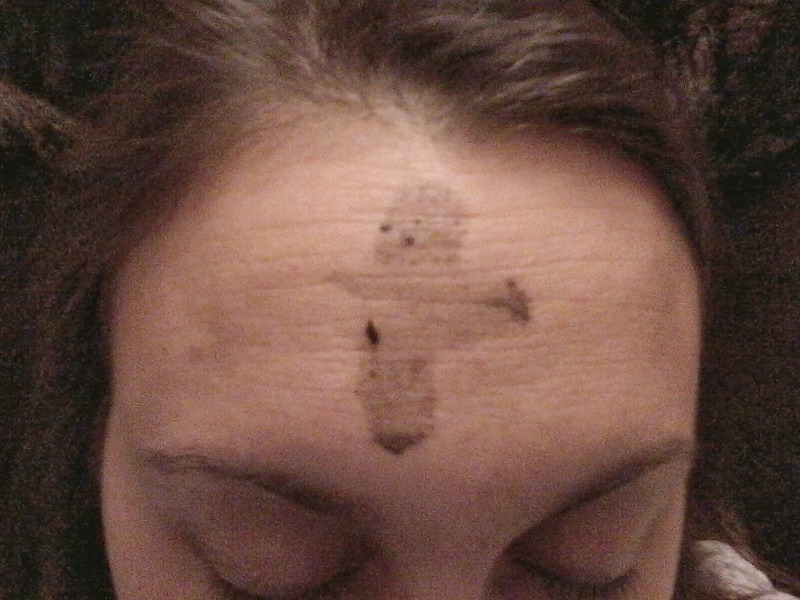 Those ashes on my forehead in the picture above are from the Episcopalian church up the street. I went by myself while John put the kids to bed. I was hoping to be inspired in some way - to feel or hear God in some way. And I did, though not in the way I expected. In the priest's homily he talked about how although he loves the liturgical readings and how they are arranged to show us larger themes in the Bible, he thinks we miss something by not reading the books aloud, in their entirety as the story tellers intended when they first wrote them. We miss some of the smaller themes that are evident if you take the books as a whole. It was as if God was saying to me that there is value in different approaches and that he understands my struggle. Found you via Clan Donaldson. I'm glad to find another linked-up blogger who's not Catholic! For me, it's less about the gay-marriage-women-priests-birth-control (because I actually identify very well with those beliefs!) and more about the theology... and my need for teachings that are strongly rooted in Scripture. Nice to meet you! Nice to meet you, too! I totally understand the desire for teachings rooted in Scripture!!! There is a huge spot in my heart for people searching for God. So glad you linked up today so I could read part of your story. I went to a retreat last weekend where one of the speakers urged us not to speak at people about how, "if they just understood" this or that they would believe, but to love them right where they are. That is such a powerful message I took away. I hope, as a Catholic, I can do a better job of loving people right where they are. The bishop also gave a beautiful homily about the joy of heaven and the great reunion of all. So glad to know you. Hi! Fellow ISFJ here, Stopping by from WWRW and clicking around. For someone who's not inclined to be Catholic, you read a lot of conversion-to-Catholicism stories. I'm impressed at your earnestness and open-mindedness! . . . I kind of understand what you mean about being able to connect to God. I'm Catholic but I don't always feel the connection at Mass, rarely feel it perhaps. Growing up Catholic, I was taught that faith shouldn't be based on feelings. But sometimes I think I've downplayed the importance of feeling in faith. Anyway, great post! thanks for reading and appreciating :-) i'll be sure to stop by your blog - I always love seeing how other ISFJ's think!